I have a wee bit experience raising some these fur balls..
Maybe I can help sometime! If/when this project project gets to see the light of day, I sure would like some help setting up one here in Mizoram. None of the tigers here in Mizoram have been officially informed of the Dampa Tiger Reserve so they dont seem to bother about staying there! Speak softly and carry a big gun! Wow ! What a sweet cat! Lucky you Jonah, to be amongst them. Do write and provide us with more details regarding their rearing as pets or do you eventually release them in the wild. Thats really something nice you have. Is it your pet or you are just raising it & then release it in wild ? Well the idea was to return her to the wild but she succumbed to distemper when she turned three.. I really miss her. jonahpach wrote: Well the idea was to return her to the wild but she succumbed to distemper when she turned three.. I really miss her. Really regret to hear that, I know how it feels, they say cats are too selfish and only love themselves, I disagree, one has to learn to recognise their way of showing love to us and you will agree its different from dogs but just as endearing. Why dont you raise another one? Do normal distemper vacines used on big dogs work on these cats? Finally in Maharashtra, one cannot raise wild animals, I was wondering how it is possible for you to do the same in Mizoram, are people more tolerant/ appreciative there? Wow Jonah. That looks like a Clouded leopard. Beautiful.Sad to know it died. There are a couple of points I would like to mention here. When one raises wild animals as pets , one has to get them vaccinated by the Vet, just like you would get your pet dog / cat vaccinated. The wild animals are more prone to diseases like rabies and distemper when they share the same space with other pet animals. These diseases would (in most cases) not be (normally) found in the wild. I have seen videos of African lions suffering from distemper in reserves where pet dogs were introduced. One minute the big male (lion) is sitting in all his glory , the other minute he is going through a severe epileptic seizure like a helpless cat. The second point is the release of such animals in the wild. It is very difficult to release such cats (which have grown up amongst humans) to make a living on their own in the wild. The best option in such cases would be to gift them to a zoo. In 2003, I rescued a chinkara, hit by a car, the govt. vet shot him with injections, the animal died later, not due to the injuries but due to the injections, the forest dept. chaps told me that if you inject injured wild animals with standard medicines used on tame animals, they usually die. But then if the wild animals are raised from childhood, then probably they may not succumb to such injections. Therefore your next statement would be correct. Prashantji, I dont think it is such a good idea to release them in zoos in India, this is my personal opinion, I would hate to see the fire going out of their eyes. Better not raise them in the first place itself. Or then be prepared for the herculean task of integrating them in the wild, which is quite beyond the aam aadmi dont you think? When I talk about "raising a wild animal as a pet" I mean feeding and looking after the animal from when he was brought in as a baby to adulthood. 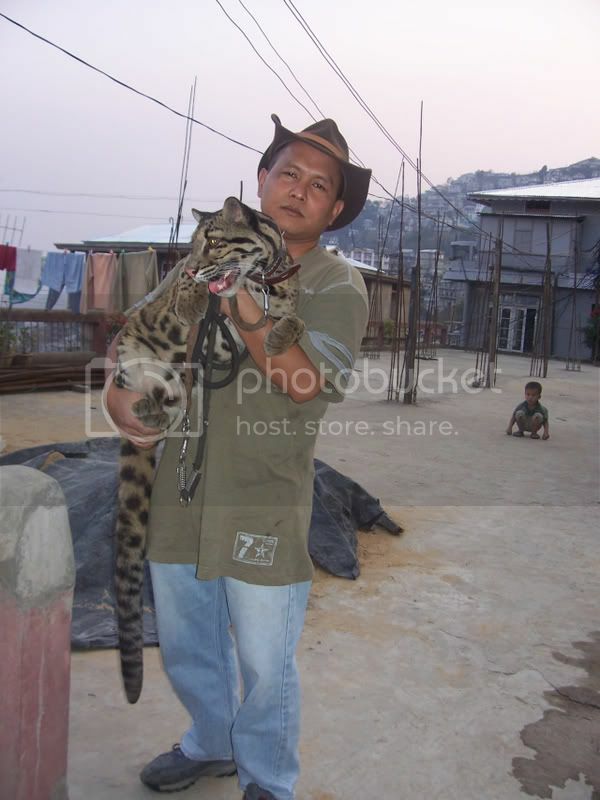 In Jonah's case (I assume) the Clouded leopard must have come into the house as a cub and must have been raised by him to adulthood (the size you see in this snap). I have friends in the Wildlife Institute of India. Dehradun who are Vet's and a part of their job involves treating injured wild animals. Actually to answer all of the above questions, we had a wild life rehab centre running during that time and we believe the clouded leopard actually developed the virus right after we gave her the vaccine shot! Oh God!, Now this is getting a bit confusing, So I need to ask a few more questions of you Jonah and hope that Prashant also chips in with some info. Did you get the leopard as a cub? If so then how old? Did you vaccinate her previously? I am sure that the Wild Life Rehab. centre would have amply experienced vets, so what was their take on her death? I am asking these questions to broaden my knowledge on the subject, just in case I find myself in a similar situation in the future. if you have the time could you also get a professional opinion from your vet friends at the Institute on the above questions? Also, while we are on the subject, I had sent the Institute an email asking them for any short term course on conservation to which I have yet to receive a reply, could you be kind enough to find out the same for me (if its not too much trouble). If I recall correctly per Jonah this was rescued from the wild...he can better explain. Listed below is article from BBC regarding the sighting of Cloud leopard and other cats in northeast. India's Eastern Himalayan rainforest could have one of the world's largest number of wild cat species, after seven species were recorded in two years. The wild cats, including the rare clouded leopard, were photographed by remote cameras with motion sensors. Wildlife experts say the discovery is encouraging considering the ongoing threat to animal life in the area. The study was conducted over two years in 500 sq km (5,380 sq ft) of forest by wildlife biologist Kashmira Kakati. All the cats were photographed in the Jeypore-Dehing lowland forests in Assam state north-east India. The seven species caught on camera include the rare and elusive clouded leopard (Neofelis nebulosa), marbled cat (Pardofelis marmorata), and golden cat (Catopuma temminckii), and four relatively widely distributed species — tiger (Panthera tigris), leopard (Panthera pardus), leopard cat (Prionailurus bengalensis), and jungle cat (Felis chaus). Deforestation, poaching and major engineering projects, such as hydro-electric dams, threaten the long-term survival of wildlife habitats. Crude oil extraction and coal mining are also taking their toll. Wildlife Conservation Society-India spokesman Ravi Chellam said that rainforests were important for preserving biodiversity and creating a livelihood for local communities. "The entire forest here should be protected as a single conservation landscape, free of disturbance and connected by wildlife corridors," he said. Anyway with regards to my darling clouded leopard, Yes. It's a real pity we are loosing so much of these beauties in the north east due to loss of habitat. In our state itself, in my opinion, It is the Forest and Wildlife Department itself that is responsiible for the loss of habitat. That's another story! Yes, Kiki was adopted at about 3 months when villagers rescued her from a burnt-out forest and took her to the city (Aizawl) to get a few bucks! We raised her hoping that we would be able to free her one day. But alas! To cut a long story short, our meagre (privately financed) Wildlife rescue centre was ill equipped to cater to her demands and although we tried to donate her to our local zoo (hoping for better care) But we did not receive much support. We even contacted Sepahijala Zoo in Tripura where they have an ongoing captive breeding programme but we baulked at the ammount of red tape and file shunting required! With regards to her vaccination and death due to distemper, I have a very strong suspicion.. I have lost at least 2 alsatian pups and one local terrier which developed symptoms of distemper just a few days of having given the vaccine. Last edited by jonahpach on Sun Feb 21, 2010 10:28 pm, edited 2 times in total. are you forgetting me ? atyachar atyachar ... what have i done ...? take me too...i am getting fed up of city life ! i will take up wildlife photography as profession or probably botany ! kuch nahi hua toh i will take the security-wala job ... atleast i could hold a rifle in my hand ! kab jaana hai bolo ... apni bag already packed hai ! Aaah,Jonah, I am very sad to know .The poor thing. We all remember her for sometime. I would be very interested to help assist with this project. I am currently working for an ecological consultancy company in the UK but have a dream to work in India and work in Tiger Conservation. Having lived in India previously, visited Ranthambhore, Kanha and Bandhavgargh on numerous occasions I am only too aware of the need for sustainable governance and of the specfic need to proivde a financial incentive for conservation to work. In my opinion this can be achieved through effectively managed ecotourism. I have spent much time in Africa (South Africa, Kenya, Tanzania, Uganda and Rwanda) and believe that the game reserves here, can to a certain extent be used as a model for development in India (obviously there is far less pressure on the resources in Africa than in India). Ultimately I know what a tourist wants and what is currently not being fulfilled by eco tourism in India and could therefore help to make Konya - Chandoli Tiger Reserve a leading example. I was educated at the University of London, hold a BSc in Biology and MSc in Sustainability and Business with a particular focus on ecotourism. I also have some useful contacts at the tiger reserves i have visted previously. If you believe that I can be of any assiatance please send me a PM and I will provide you with my email address.